LitChat celebrates its one year anniversary this week. LitChat’s Twitter account was created on January 29, 2009 and on the same day we created a blog (www.litchat.net) to augment our web presence. Notice in the tweet above that our first chats were held Monday through Friday. Early topics were discussions of what books people were reading, what books were releasing, and what books hit the bestseller lists that week. Three weeks of daily twitter chats proved too much and in the fouth week of chats we dropped to three days a week, Monday, Wednesday and Friday. 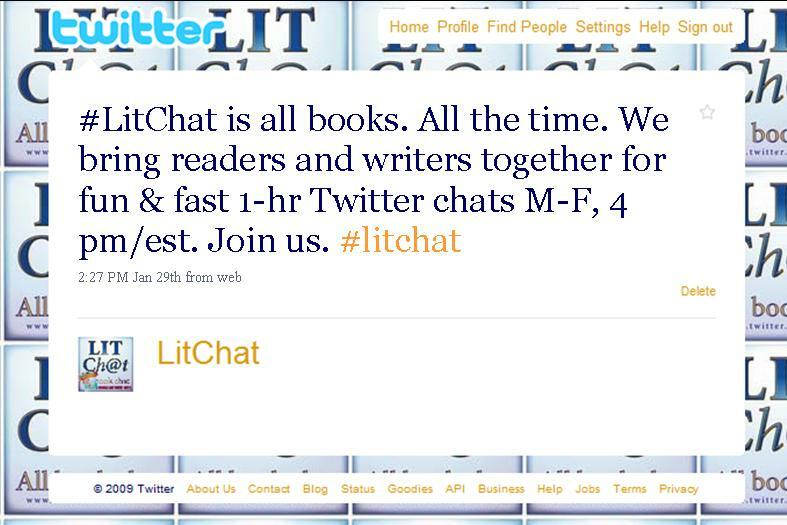 The first author who joined regularly in the conversations was Kristy Kiernan (@KristyKiernan), who immediately understood the potential of #litchat for building literary community and promoting books. Kiernan went on to become the second author guest host on March 13, 2009. We launched our first book-specific chat during the week of March 2, 2009, Current Events in Fiction–Novels that Mirror the News, inspired by the book Shimmer by Eric Barnes (@EricBarnes2). Barnes stepped in as the first guest host of #litchat on March 6, 2009. We learned how to archive chats in April, preserving our first #litchat on April 17, 2009 featuring poet Dobby Gibson (@DobbyGibson). In a single year, LitChat has grown beyond expectations, creating a community of more than 5,000 people who read widely, who support literacy, and enjoy talking about books, writing and getting books into the hands of readers. Regular participants of #litchat include people from around the globe, many of them staying up late or rising very early to catch the chats. We took our passion for books and reading into the holiday season with the creation of the LitChat Books Are Great Gifts campaign designed to promote book sales. The crowning achievement of this campaign was the first ever auction held live through Twitter that raised more than $1350 for The Reading Tree, a charity that recycles used books for placement into classrooms in poor schools across the globe. This week in #litchat we’ve invited many of last year’s guest hosts to join us, including Kristy Kiernan (@KristyKiernan), Virginia Deberry (@deberryandgrant), Carleen Brice (@carleenbrice), Eugenia Kim,(@Eugenia_Kim), Luis Alberto Urrea (@Urrealism), Trish Ryan (@Trishryan), Maggie Dana (@maggiedana), Jag Bhalla (@hangingnoodles) and Kristina Riggle (@KrisRiggle) and Lauren Baratz-Logsted (@LaurenBaratzL). Join us to hear updates on where they’ve been, how their books have been received and what they’re working on at present. We hope you’ll join us on Monday, Wednesday and Friday this week to join in the conversation. Remember, LitChat is all books. All the time. Founded by journalist and author Carolyn Burns Bass, LitChat was inspired by the successful #journchat founded and moderated by PR guru Sarah Evans (@PRSarahEvans).